This is very possibly the most time I’ve spent on one book in years. It’s High Fantasy, so has a fairly complicated 700-and-odd-page plot along with a multitude of different characters and multiple dimensions. Couple that with my birthday week, a Lupus flare-up and a Boyfriendly Visit and the result is a blog that is fairly sparse on the review front. Never mind, I’m back now with a groaning TBR shelf waiting to be read! So basically it’s the story of Elizabeth I’s childhood embroided with fairies and changelings. There are two sets of fairy twins – Denoriel and Aleneil are the ‘good’ set, trying to protect Elizabeth from the ‘bad’ set – Pasgen and Rhoslyn, who are trying to abduct her to prevent what they know the future will hold – a happy England and therefore less power for them. If you’re not a fan of High Fantasy, this is not for you. Ms Lackey’s books are usually quite light and easy to read, but this was co-written by Roberta Gellis. I’ve never read any of her books, but I’m guessing she has a slightly heavier style. It’s a very complicated storyline, with a lot of magical theory, different lands and characters with similar names, all of which can be a bit difficult to keep straight in your head. I’m not saying it’s not good – far from it. It’s just that if you go into it expecting a light fairytale… well, you’re just not going to get it. I love Tudor history though, and magic, so this had ‘Hanna’ written all over it. The authors have clearly put an awful lot of research into this book though. 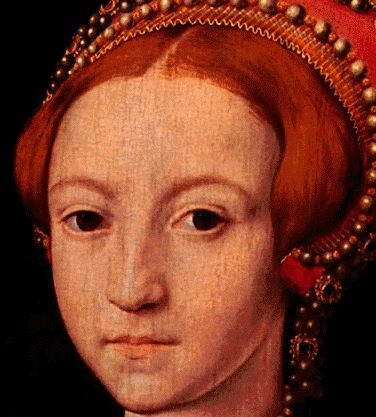 It doesn’t just mention the obvious – Anne Boleyn had her head chopped off, Henry VIII didn’t like Anne of Cleves, etc – but the entire plot derives from the lesser known bits. Henry Fitzroy, King Henry’s illegitimate son, is not very well widely known but still features prominently in the book. This is the second in the series (which I wasn’t aware when my Mother was waving it at me), but it doesn’t really matter. Mercedes Lackey is usually fairly good at explaining what’s gone on in previous books, and Ill Met By Moonlight is no exception. I’m sure it would be easier if you had read the first one (This Scepter’d Isle) but it’s no great loss. The one problem I had with it was the portrayal of certain characters. Obviously nobody can actually know exactly how Elizabeth and Mary behaved and felt – they’re long dead and royalty tend to wear invisible masks at the best of times. But there’s a certain acceptance (in historical fiction at least) that Elizabeth, even as a child, was precocious and calculating, while Mary was loving and affectionate until she hit middle-age with no sign of a child. I’ve never read a more unlikeable Elizabeth than in this book though. She’s hostile, smug and whiny all at the same time and at times I think she’d have deserved it if she had been captured by fairies. Oh shut up. Denoriel is obsessed with her, but it never quite explains why. She’s horrible to him. Actually, their relationship is a little creepy. He acts like he’s in love with her, when he’s an ancient fairy thing and she’s nine years old! Mary is whiny, sullen and continuously complains that her life isn’t fair. Thankfully, she doesn’t feature that often, but that’s a direct contradiction of what we all think we know about Mary. I suppose that historical fiction is just a more serious form of fanfiction – just using real people as your characters. You didn’t invent them, but you have to stick to somebody else’s idea of them, so I suppose it’s quite hard to make it seem real. This wasn’t a huge problem with the book – it’s baearable and didn’t ruin the story, but it does stick in my head. It’s a good story and it’s possible to get really engrossed in it – but be prepeared to invest a lot of time in it! I’m going to read a few lighter books first, but then I’m definitely going to read the first one. What an odd sounding book! Charity shop find? @Hannah – yes, but by my Mum. We love Mercedes Lackey, so we pretty much snap up anything she writes.